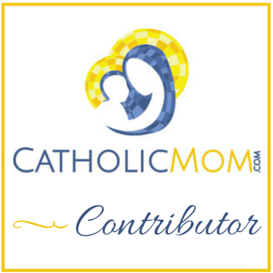 Good friends that I can share my faith with, prayer, petitions, and important discussion about motherhood and our Catholic Faith. Flashlight hide n seek in the dark house before bedtime. Reading time with my daughter, gives me a chance to be with her, look at her and see how much she’s grown. The dinner company of good friends who were an integral part of our marriage prep. Daily Mass (even with the three-year-old’s exhausting antics). Laughing together with my husband and kids about silly things that mean absolutely nothing. Library story-time and reading together with the three-year-old and baby. The feeling of accomplishment – finished ironing some clothes to consign and worked on a simple craft project I’ve been working on for way too long now but it’s almost done! My mom and sister who are available and willing to help me when I need it – it’s the small things like staying with the kids in the car so I can run into the store quickly by myself and look at paint samples that really count. Getting up early enough to do 5 – 10 minutes of muscle strengthening floor exercises before school. My husband and our family we have together, I’m thankful for my husband’s job and that I can be ‘at home’ with the kids while they are young – I complain a lot about the housework and the whining and all that but I know I really have it made. What are the joys you are thankful for? September 19, 2013 September 19, 2013 Erika MarieThankful ThursdayThankful Thursday, why whine when you can give thanks? our vocation is hard. you are doing a great job, friend. keep it up.